Looking for That Perfect Children and Family Portrait Photographer? 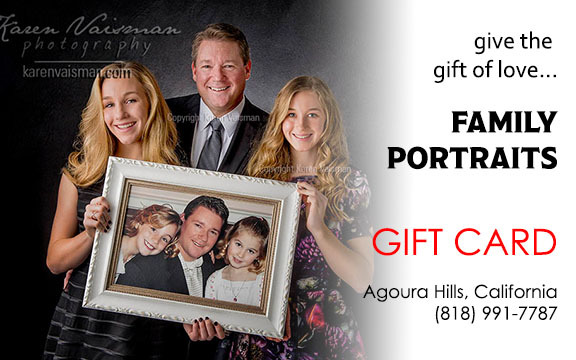 Many people ask, "Where can I find good Westlake Village family portrait photographer?" Finding that unique match between a creative portrait artist and a client seeking a specific "look" of photography they like, can be a challenge. There should be a bit of "butterflies in the stomach excitement" when you land on a website that displays that exact emotion you want to capture during those fleeting moments with your children. Finding the right professional might take some work, but the photographic legacy they will leave for your progeny is worth the time you have invested in the search. One focus of my website is on corporate headshots, which you may have noticed. But as a mom, my heart holds a special place for children. I have a bittersweet pang in my heart that my girls are grown and gone, but that doesn't mean as an empty-nester I can't still help you capture your family memories (I admit, a bit vicariously) with the same passion that I have photographed my own family! I am originally from New York and went to college for my passion: photography. After earning my Bachelor of Fine Arts in photography from Syracuse University, I moved to California to the Conejo Valley, the Westlake Village area. Below please take a look at some of my sample family and children portraits. Don't you just love the unending innocent curiosity in their eyes? I love to tell a story with their expressions! Big People, Little People, and Pets Too! Do you have a creative idea you would like to discuss for your own family portrait? Perhaps a meaningful family heirloom or a vehicle you love as a prop? Maybe your whole family has a favorite sport you might like to incorporate into your family portrait? I love to include grandparents for a "generations" portrait! When you are ready to schedule your portrait design consultation so we can collaborate on your unique family portrait, please let me know! Feel free to download my free guide for 11 Tips on how to prepare for your portrait! Time is something we can never recover. Once that new little member of your family is conceived the clock starts, and waits for no one! Being prepared, and knowing you would like to find the perfect Westlake Village family portrait photographer who can capture those treasured moments is the best gift you could give yourself, your child and your family. Researching and finding the right professional to bring into your life, BEFORE this very emotional time is truly prudent. Lack of sleep compounds all the new responsibilities your family will be experiencing, adding to the happily planned chaos. Knowing in advance you found a trusted talented professional photographer who will capture those memories will be a load off your mind. Planning early will help you focus on your new bundle of joy! Scheduling a newborn session can be a moving target, but I'm used to it, and more than happy to work with you. Contact me in advance and I'd be happy to set up a portrait design session to discuss your goals and ideas. We will chat, I can share with you the different products I offer, including wall portraits, albums, gift prints, custom designed baby announcements and gallery wrapped canvases, so this will be one more item you can check off your list in preparation for your new bundle of joy! Find our session information here or give me a call to discuss your ideas! (818) 991-7787. CALL FOR YOUR PORTRAIT DESIGN SESSION NOW! A common question is "Where can I find a photographer near me that I can trust to do a fabulous job?" I focus on my local Westlake Village service area in order to pamper my family clients. Studio photography offers a beautiful and artistic level of control to the lighting, but I am happy to travel to your location within a few hours drive from the Conejo Valley, California (additional fee applies). I offer both black & and white and color based on your tastes.